The Scottsdale Ballet Foundation is a qualified 501(c)(3) charitable organization promoting and presenting student ballet performances, furthering the availability of quality dance training in our community, and enhancing appreciation for classical ballet in our community. 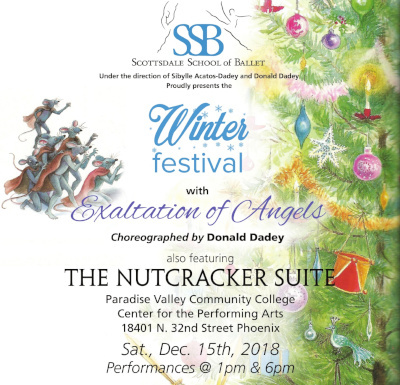 Scottsdale Ballet Foundation is proud to sponsor the Scottsdale School of Ballet in the 2018 Winter Festival featuring “Exaltation of Angels” and “The Nutcracker Suite” on December 15th 2018. Performances at 1:00 p.m. and 6:00 p.m. at the Paradise Valley Community College Center for the Performing Arts. This is a nationwide event so please pass the flyer on to everyone you know. They can make purchases at any Barnes and Noble in stores on November 17th and 18th. 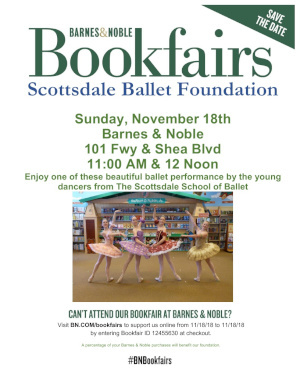 Stop by the Barnes & Noble at 92nd Street and Shea Blvd to see the dancers from Scottsdale School of Ballet on November 12th at 11:00 a.m. and 12:00 noon perform excerpts from the upcoming 2018 Winter Festival! On May 21st & 22nd 2016, Scottsdale Ballet Foundation presented 2016 Soiree de Ballet: The Ballet Class La Boutique Fantasque Paquita, with guest artist Shea Johnson. On Sunday December 6th 2015, Scottsdale Ballet Foundation held the annual Nutcracker Sweets Tea Fundraiser at the Phoenix Country Club Ballroom. I would like to sincerely thank you for Khandis' opportunity to audition for Scottsdale Ballet Foundation SI Scholarship. We are very grateful for the generous award she has been given. What a great program and opportunity your foundation has for ballet families during SI season. Again, thank you very much. It is going to be a huge help for our family. What a great program and opportunity your foundation has for ballet families during SI season, especially for families with two dancing ballerinas like us." I was chosen to receive the Scottsdale Ballet Foundation Summer Scholarship this year, and I am writing this letter to express my sincerest thanks to you for providing this scholarship. I was very excited to receive my award and letter. It is an honor to be recognized for my hard work, and receiving this scholarship motivates me to continue to strive for excellence. I will be attending the Scottsdale School of Ballet Summer Program for all four weeks. Thank you so much for the extremely generous scholarship that you have awarded me with. I appreciate that you have recognized me with this honor and I am very thankful for your generosity. 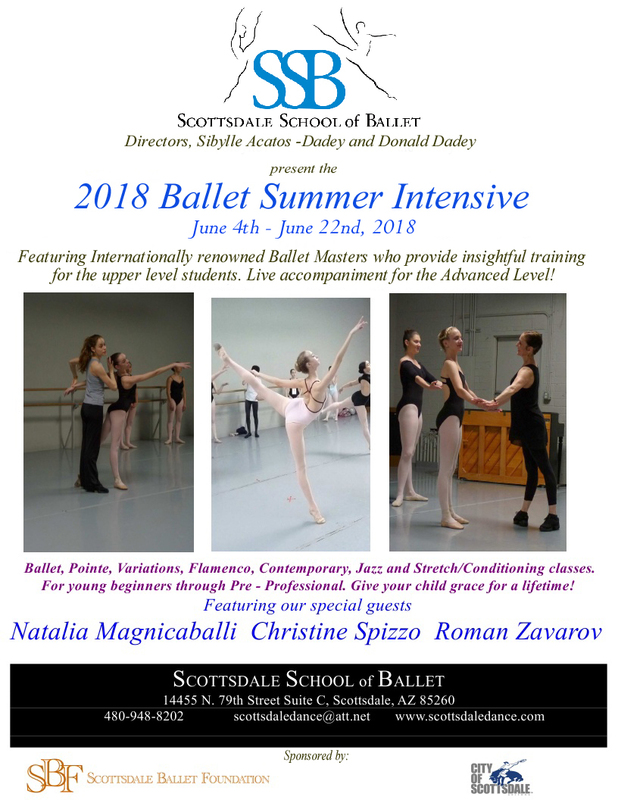 I am very excited to be attending the Texas Ballet Theatre Summer Intensive as well as doing two weeks of the Scottsdale School of Ballet intensive. I am looking forward to working hard this summer and continuing to strive towards my goal of becoming a professional dancer. Thank you again for recognizing me and my hard work! Thank you again for the scholarship toward my summer ballet training. I had an amazing time in Houston! Having been able to participate in the Houston Ballet summer intensive helped me achieve my goal of being accepted to Pacific Northwest Ballet as an upper level pre-professional student.